Aidan Fletcher is the son of Jason and Cathe Fletcher. 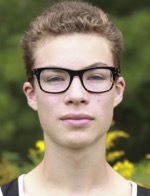 Aidan is currently in his sophomore year of High School and has been running cross country since for four years. in addition to Cross Country, Aidan is also a member of the Hornet Track team and Distance Running Club. Aidan has also participated in the Wellsboro Summer Swim program for 8 years. In his free time Aidan loves music, film, reading, and running and also films games for the boys soccer team.